On hearing the news that there is still an ongoing row and huge backlogs of vehicles waiting for an ITV at Las Chafiras. I thought I had better get in there quick as our Pick Up is due for test in the next few weeks. It has been reported that some drivers were queuing as early 2am to make sure of getting their car booked in, and by the 7am opening time, there can be as many as 80 vehicles waiting. Yuk, not good. Vehicle owners and garages are now not able to pre-book without a registration number, and block-bookings in advance are not taken unless you have the necessary paperwork which means that legal garages can no longer book spaces in advance unless they supply registrations for each vehicle. We have tried calling several times. The phone is never answered or is engaged. You can book on line! Great, that’s the answer – no chance, you can only book ahead about 3 weeks in advance and every slot was already booked. Last resort we’ll call in next time we pass and book in person, well we might have been able to if we’d had the time to wait in the long queue! 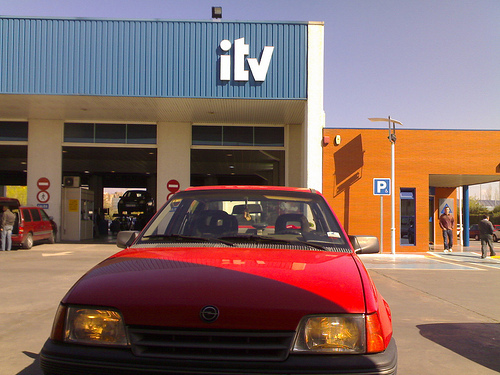 The problem for us now, if our ITV runs out before our allotted test date, when we finally get one, we’ll be driving illegally! !